This is the first time I have used liver of sulphur to patina my silver rings. I really liked the effects that that other people have created with this process so I decided to give it a try. My first task was to work out how much solution I needed and at what strength. This got me excited as I loved chemistry in school. Lol!!! Oh WARNING THIS DOES STINK!!!! so make sure you do it in a well ventilated area. The instructions told me how to make up 355mls but I really don’t need that much. As this solution can not be kept, you only need to make enough quantity to patina the amount of items you are planning to do. So I decided to only do a small amount of solution but I was not sure what strength. My first solution I made up was 1/4 teaspoon of the liver of sulphur to 100 mls of hot tap water. I found with continuous dipping the rings into the solution it did give a very light patina but not what I really wanted. These photos are the result of my first test to patina. 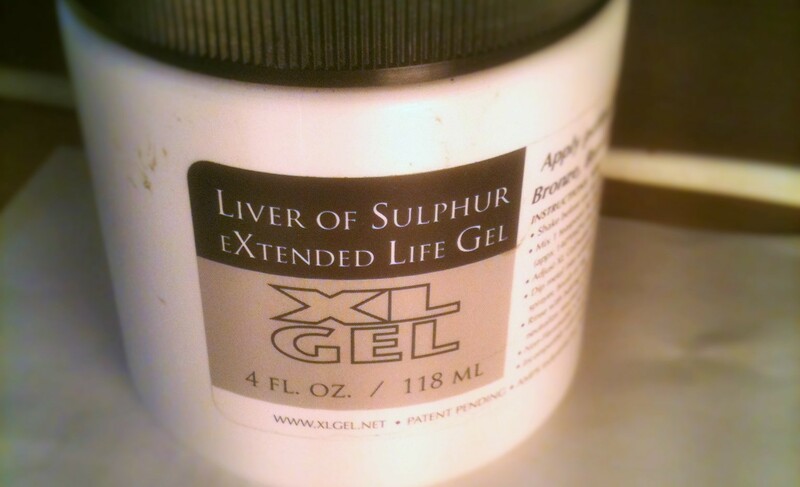 With my second solution I used 1/2 teaspoon of liver of sulphur to 100 mls hot tap water. This did definitely darkened the rings but I found that I needed to leave the rings in the solution for a few minutes rather than dipping them. Dipping is an interesting way of watching the metal change in colour. As you can see the second solution resulted in a much darker patina. I have textured one of my rings and to get the texture to stand out I used 2000 grit sandpaper. To get rid of your liver of sulphur solution all you have to do is add bi-carb to it mix it well and pour it down the sink.